We are happy to welcome our Guest Bloggers back to our blog, the experts from Basq Skincare! Make sure to check out their first tip on how to achieve the perfect pregnancy glow! Below is their second tip that explains how to prevent and combat stretch marks! From basq: Target Marks with Ingredients that Work! The most confusing step in a stretch mark care routine is choosing the right stretch mark butter. There are so many options at different prices and all promise to prevent stretch marks. So how do you choose? You need ingredients that go beyond moisturizing because when it comes to treating stretch marks, moisture isn’t enough. For real stretch mark care you need ingredients that help build skin strength below-the-surface where stretch marks occur so your skin absorbs and uses that moisture to build collagen and elastin. The next step is to find ingredients that work and still be safe to use during pregnancy and nursing. At Basq, we spent a lot of time identifying these types of ingredients, but we didn’t stop there! Our butter had to feel great on the skin. Our Advanced Stretch Mark Butter is that perfect trifecta: Safe, effective and gorgeous. It surpasses regular butters because it contains Algesium C and Darutoside – two ingredients proven in clinical testing to prevent and repair marks. It also has nutrient-packed butters and omega rich oils to build and strengthen the skin. One last bit of advice: Make sure you know your mark zones! Stretch marks happen on the belly, bust and backside – this is a treatment butter built for those zones . Use it twice a day for best results. 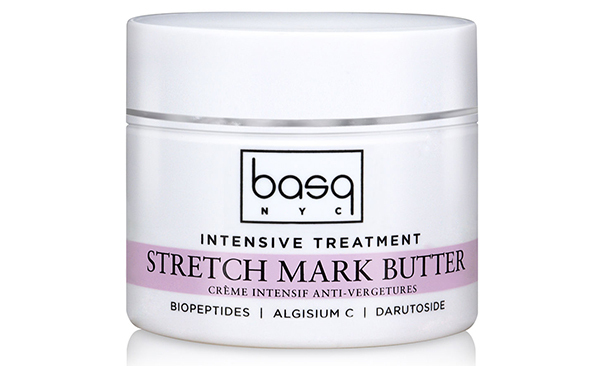 Stay tuned for Step 3, Beat Stretch Marks with Basq, and more helpful tips from Basq Skincare!